Author bio: Sam is Owner of Edison Office Cleaning - A successful cleaning company in Southwest Florida since 1992. 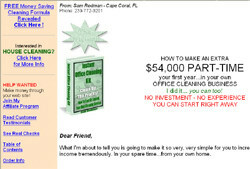 Blurb: $54,000 Part-Time Cleaning Offices - I did it...You can too! I've put together a complete home-based Starter-Kit designed to help you succeed in the office cleaning business. It contains the documents and information you need in a downloadable format. I've taken the mystery out of how to get the account and how to price it right. No one spells it out for you easier than this or gives you the specific information you must have to succeed. Let me tell you, this Instant Office Cleaning Kit gives you an amazing head start. -How to get business the smart way without expensive advertising. -How to organize each job to finish faster, and create more profit. -How to project a professional image and get top dollar for your service. -How much to charge. A simple formula that's right on the money. -What kind of people to hire to do the work. -A risk-free proven method of getting customers in your area. -How to get started with little or no money. -The finest professional documents available...Satisfaction Guaranteed! -Step-by-easy-step instructions: Show you how to get started risk free, totally from scratch or expand and upgrade your existing cleaning business with no additional costs. -Source of leads: You don't have to hand out 200 business cards and hope for the best. My proven methods of getting leads will help you to obtain more business than if you were running an expensive full-page advertisement in the phone book! Leads obtained using these methods are hot and free for the asking. You'll learn exactly what to do and how to do it. -Introduction letter: Leave a lasting impression and distinguish yourself from the competition with this outstanding introduction letter. You will grab customer attention and your business will increase. This letter in itself can actually get new business for you without doing any "selling"at all. -A professional service agreement (the bid): It's a proven job-winning service agreement like none other. It's so effective, it was used by the F.P.L. "Florida Power and Light" company as a standard for cleaning contractors who want to bid on F.P.L. buildings! This service agreement was inspired and developed with feedback from actual office managers themselves. (the decision makers) This is what they want to see! It's been revised, tested and proven for over 10 years. This one document by itself is worth the price of the entire kit. It will give you a professional and competitive edge like nothing else! -Anyone who wants a full-time income from a part-time effort. -Anyone who wants the security of getting several paychecks instead of just one. -Anyone who is already cleaning offices and wants to boost their income in a professional and economical way. -Anyone who needs to increase their income. -Anyone who wants to build a home-based service business at their own pace. -Anyone who wants a recession-proof business with a guaranteed income every month. -Anyone who wants a rent-free office in their own home with no inventory involved. -Anyone who simply wants a running head start in one of the most lucrative service businesses on this planet.